Surely you remember Obama’s $787 Billion emergency economic stimulus spending bill from this time last year. It became known as the American Recovery and Reinvestment Act of 2009. Obama promised it would create millions of jobs and keep the unemployment rate from exceeding 8.5%. What is now undeniable – even by those who drank the Kool-Aid and chanted the slogans – is that it didn’t work. But, don’t despair, the Dear Leader has a solution. Lie about the results. That’s right, ladies and gentlemen, the White House has now changed the way the millions of new jobs which are being created by the stimulus spending are counted. One would have hoped that any such change would have been made because of an abject inability to count that high. But, alas, that’s not the case. The Dear Leader changed the method of counting job creation in order to cover up the utter failure of the most massive spending plan in history. For months the White House has been hearing criticism from across the country about problems with the $787 billion stimulus plan, ranging from how it has been ineffective at creating jobs to the claims for job creation going to fairy tale congressional districts or even phantom ZIP codes. So how did the Obama administration choose to respond to this criticism? Rather than addressing these concerns with honest and constructive changes, the White House is instead just relaxed the reporting requirements for stimulus recipients so the jobs data looks better (as you might recall, the White House previously admitted problems with the stimulus but refused to make any changes. Instead of reporting on the number of jobs "saved or created," a bogus term from the very beginning, Recovery.gov will now merely track how many jobs have been funded by stimulus money, regardless of whether they were created by the stimulus or had already existed. These new changes will remove even the slightest thread of accountability from the stimulus, which was supposed to be accompanied with unprecedented transparency through the website Recovery.gov. Instead, as CNN points out, "Now we’ll never know just how many jobs were funded by the $787 billion stimulus program." 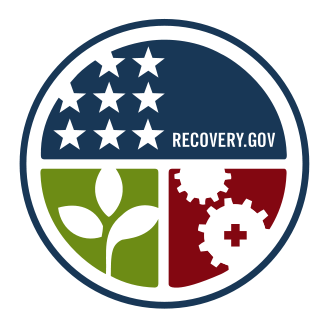 The only things we can be sure of are that the Recovery.gov website cost $20 million to revamp and the above logo represents One Trillion Dollars of our money wasted. President Obama originally promised that the stimulus would be responsible for "generating or saving three to four million new jobs" by the end of 2010, a point reiterated by the chairwoman of the President’s Council of Economic Advisers this past September. But now it’s impossible to know how many jobs have been funded by the stimulus, rendering the jobs claim yet another broken promise to American taxpayers. Democrats have always advocated tax and spend economics even though these policies have never succeeded. Ever. The problem, though, is that even with the White House reeling from the multiple blows to its credibility on the stimulus, leaders in Congress and President Obama himself are said to be considering yet another massive stimulus, this time pouring more money into infrastructure projects. You know, the same projects found in the original stimulus that have not contributed to economic recovery. It’s time the Obama administration stop advancing massive government solutions. It is absolutely time they stop lying and find a way back to accountability. The good news is, there are no more terrorists in Afghanistan. That sounds strangely like a stimulus plan that has created millions of new jobs, doesn’t it? As I am about to hit the publish button on this article, the liar who presently occupies the White House is on TV telling Americans that the plan has worked. Has anyone else had enough?